Sydney - Key Australian all-rounder Shane Watson has been ruled out of this week's first Brisbane Test against South Africa, with Rob Quiney called up as his replacement, Cricket Australia said on Monday. Australian vice-captain Watson withdrew after failing to recover from a calf injury sustained in a Sheffield Shield match for New South Wales against Queensland. The 31-year-old has been prolific for Australia with both bat and ball in all formats recently, and his absence could be a major blow to the team. 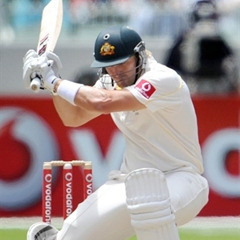 Victorian batsman Quiney will replace Watson and earn his first Test cap in Friday's Test, CA said. Quiney, 30, made an impressive 85 and unbeaten 11 for Australia A against South Africa at the Sydney Cricket Ground in a three-day tour match that ended in a draw on Sunday. Australia coach Mickey Arthur said selectors were hoping Watson would be available for the second Test at the Adelaide Oval on November 22. "We just think (Watson) will not be fit enough on Friday," Arthur told the Australian Broadcasting Corporation. "We didn't want this to play out the whole week, we wanted to make a decision pretty early and get some real clarity in the team. "That means Rob Quiney makes his debut this weekend against South Africa." Arthur said he was confident Ricky Ponting will play in Brisbane after hamstring trouble. "We're very up-beat, it's a Test match week, a very special week. We're really excited," Arthur said. "We're relaxed, we're calm, the team is in a really good space, we're really hungry for some success. We see this as a massive opportunity for us. "In an ideal world, you want Shane Watson batting and bowling for you. Fact is, we're not going to have him. Fact is we won 4-0 against India last year without Shane."